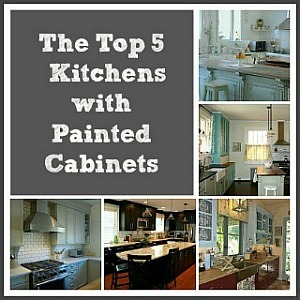 So far in my ongoing contest you’ve voted for your favorite white kitchen, your favorite kitchen with wood cabinets, and your favorite with painted cabinets. 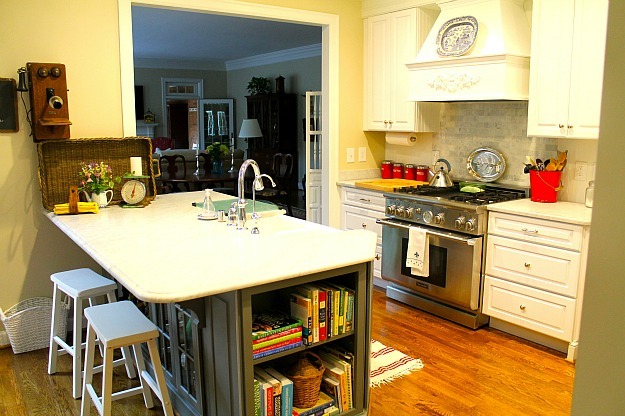 Here are 5 of the most popular smaller kitchens that were submitted by readers. 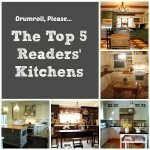 Take a look and then tell us which one you like best (subscribers will have to click over to my blog to vote). After you vote for your favorite in each of the 5 categories (1 more to come! ), you’ll choose the overall winner, who will win a $150 Visa card and bragging rights. 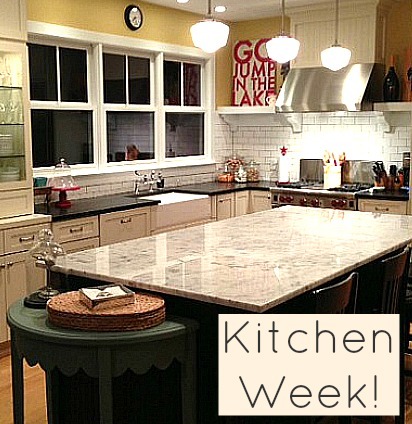 You can see the other kitchen contest entries here. I would have to say Janette’s is my favorite – I think it might be the books! A couple of the others are “pathways” in and out of the house, and I’ve had a kitchen like that. A bit too much traffic. But they are all just so charming! 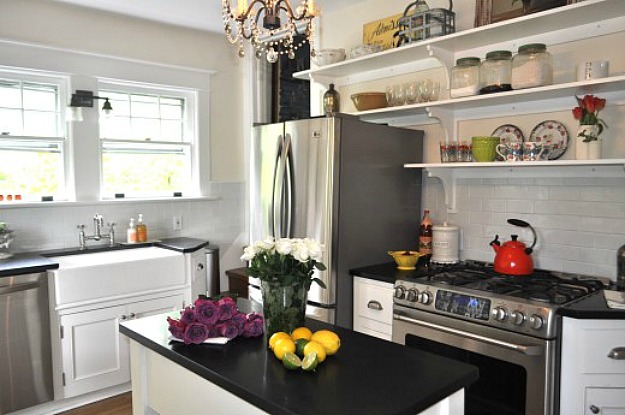 LOVE the beadboard in Ainhoa’s kitchen, too. this is a tough one Julia… they are all so sweet! And packed with character! I love them all but I think Ainhoa’s has won my heart, that’s just gorgeous. Good morning Julia it is 1.04 in the morning sitting here watching Le Tour De France. I thought i’de check the Ipad one more time and there the pressure is on to choose from these wonderful kitchens it was tough but I chose No. 5 Ainhoa’s kitchen. I wish all the ladies the best of luck. Thank you for sharing. Oh god there goes the pile up it looks so painful I think it was one of the American riders he’s OK. It’s almost bedtime. Till next time Regards Esther from Sydney. Ainhoa’s stole my heart for some reason…It’s cute, charming and vintage. Just reminds me of the kitchen of my childhood. I like them all, but I wouldn’t call them “small” – they seem just the right size to me. “Small” is a relative term, for sure. These are the smaller kitchens that were submitted for the contest, though. 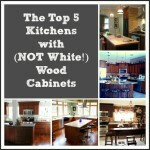 All of these are great and very livable – something very important in a kitchen! I really like Ainhoa’s floor…hard to believe it is not real brick! I like Janette’s the best. It seems warm and inviting and I love that antique phone. That was by far the most difficult voting decision I’ve had to make in this series! All the kitchens were to my taste, all lovely. Oh, and this was the first vote in which I didn’t line up with the top kitchen (at least at the time of my voting). I voted for Amy’s kitchen. Made me want to be there. But really, I loved all five of these. I find Amy’s kitchen the most like home to me. They are all so lovely. I picked Kathleen’s because of all the wonderful windows. It makes kitchen chores so much nicer when you can look outside and enjoy the birds chirping, the butterflies floating, and the squirrels….being downright squirrely! Kathleen’s because of the windows. This is the best way to do “upper-less” –a wall of windows to the outside. 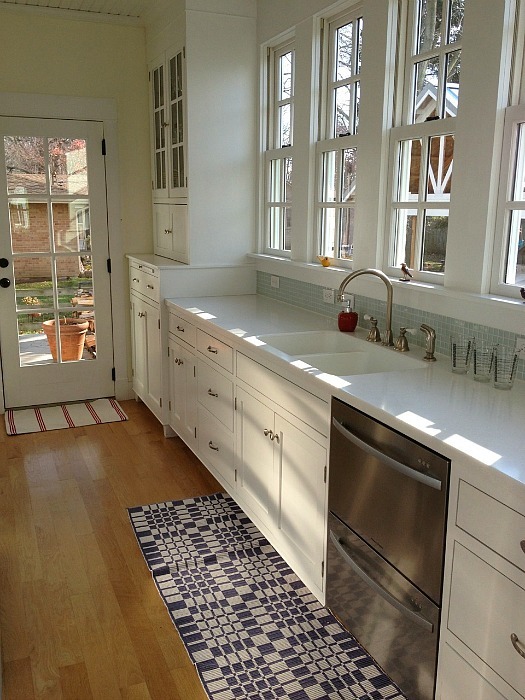 It opens up the galley and makes the smaller kitchen look open. 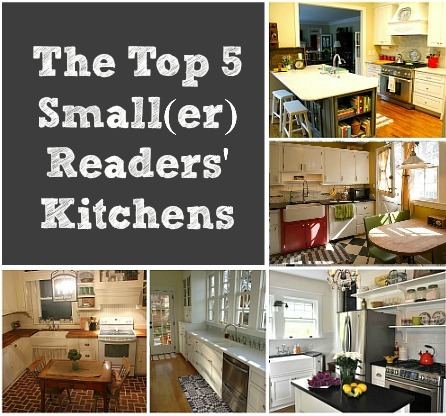 All of these kitchens are really great, but none of them are very small. I live in NYC and my husband has designed the most innovative, interesting, unique and special kitchen I have ever seen. Our apartment is a studio and he managed to make a teeny tiny kitchen seem like a haven. How do I enter his kitchen into a contest somewhere? Any advice? Thanks, and love your website! I LOVE Ainhoa’s! I can’t get over her floors and just everything looks cozy and warm. LOVE it. Kathleen’s! I have to support galley kitchens for obvious reasons. 🙂 All are wonderful, I am a fan of the small kitchen and have learned to love mine. This was a seriously tough call! I ended up going with Kathleen’s because I adore all the windows, love white on white in kitchens and the tile. 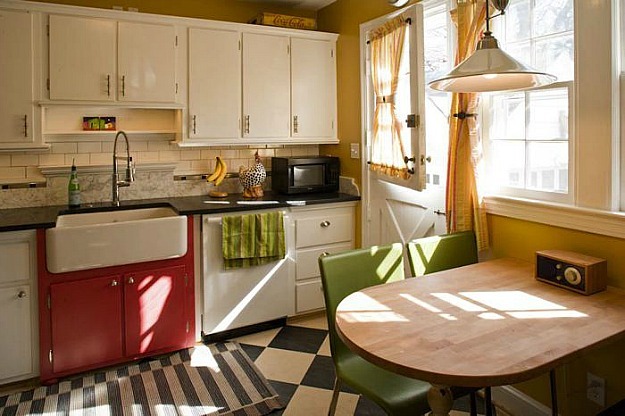 Amy’s kitchen was a close second; it’s so incredibly cozy and I love the colors and floors. 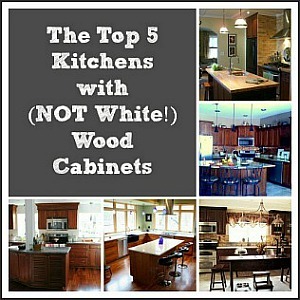 This is really hard, and I think all of these kitchens have something going for them and have used their space well, often with difficult existing windows, doorways, and stairwell (as in Jennifer’s) to work around that you often find in older homes with smaller kitchens. While I love the row of windows in Kathleen’s and its galley lay-out reminds me of my own, for pure charm I’m going for Ainhoa’s. 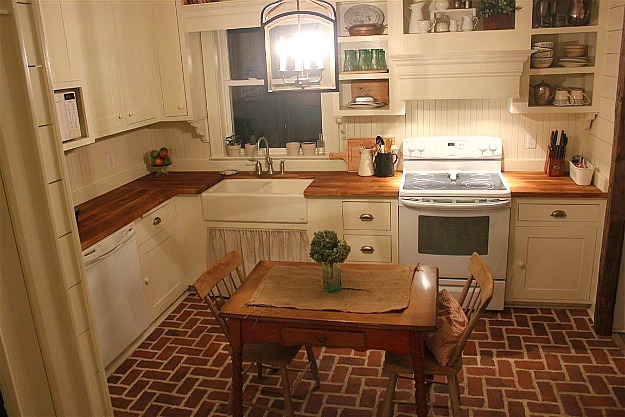 It’s so funny because I remember when you posted my kitchen on your blog a couple of years ago when I was Vintage Sassy. I started a new blog and my first post is on my kitchen. Stop by when you have time. I’m so happy to hear from you, LeAnn! I get questions about your kitchen all the time but the link to your old blog didn’t work anymore and I wasn’t sure what happened to you. Glad to hear you’re back in blogland. 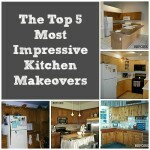 I still love your turquoise kitchen!! I agree that this is another really difficult choice. I like them all and can find something about each of them that I appreciate. I love the row of window’s in Kathleen’s and the color, floors and tiles in Amy’s kitchen, but for pure vintage charm there’s just something about Ainhoa’s–it’s just so cozy and warm. 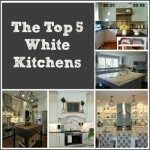 Five inspirational kitchens. Very difficult choice – I personally like Amy’s though. I have to say Kathleen’s is my favorite. The windows make it feel so much larger.